In comparing structural steel to concrete and wood, Rob Still, PE, senior structural engineer at T.Y. Lin International, Lindbergh, Charleston, South Carolina, points out that wood is subject to mold, mildew, rot, and termite damage, so while it may be considered sustainable, its life expectancy is generally less than steel or concrete structures. Compared to concrete, structural steel is a lighter, stronger material, allowing for dimensionally smaller columns, longer spans, greater openness, and reduced foundation requirements. Of the major framing materials, only structural steel is regularly recycled back into new structural framing material. Some concrete members are down-cycled into road base. The rest goes into landfills, like wood, which cannot be recycled. Structural steel members can also be reused in place or in new building projects. “The steel advantage really comes from its light weight, speed and ease of installation, and resistance to corrosion and deterioration,” summarizes Still. Furthermore, the steel industry is actively working on new technologies and materials, such as buckling restrained brace frame systems and high-strength steels, to further lighten steel structures. “Both of these advancements are leading to lighter, more efficient, and more sustainable structures,” he adds. Steel framing also offers the most long-term flexibility in that it easily can be strengthened in the field by welding on stiffening elements should loading needs change over the life of a building, she says. 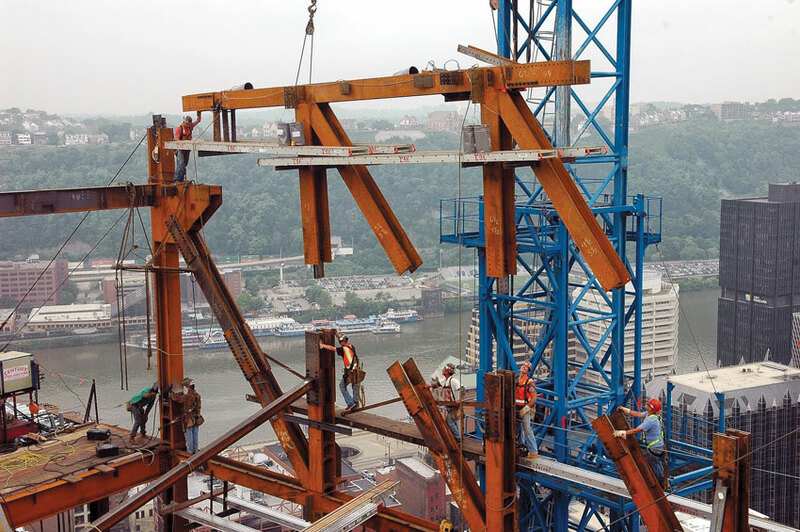 Shown during the erection of the structural steel frame, the new 33-story LEED Platinum Tower at PNC Plaza sits on a five-story podium and houses more than 800,000 square feet of commercial office, auditorium, lobby, cafeteria, parking, and amenity spaces. The superstructure is entirely steel framed using composite steel beams with a steel-braced lateral system. In all, the project uses 8,000 tons of structural steel and 200,000 bolts. Another example of the efficient use of structural steel is that it can be used for both the required support of structural loads and as a finish material, according to Tim Keil, RA, associate principal, Studio Ma, Phoenix. And it remains true as well that domestically produced structural steel is a highly recycled and recyclable material. The recycled content of domestically produced, hot-rolled structural steel is greater than 93 percent. The variation is the result of small amounts of ferrous and nonferrous materials being added during the production process to achieve the proper chemical balance for the specific grade of steel being produced. Unlike other materials, such as concrete, which is typically down-cycled into road base, steel is 100-percent recyclable, without any loss of the metallurgical properties. Structural steel is a true cradle-to-cradle building framing material. Of course, it’s one thing to be fully recyclable, in theory, but another to actually be recovered and recycled or reused. Industry wise, 81 percent, by weight, of all steel products are recovered, with an impressive 98 percent of structural steel recovered for recycling or reuse. This compares to aluminum’s recovery rate of 65 percent and a rate less than 40 percent for wood. Steel, by far, has the highest recovery rate. The construction industry, as a whole, consumes a significant percentage of the world’s natural resources and energy. However, performing a true comparison is a complicated endeavor. Unfortunately, it is not uncommon for building teams to mistakenly evaluate a framing material’s sustainability characteristics based upon CO2 emissions per unit of mass alone. On the contrary, a material’s contribution to the environmental impacts of a project are a function of the amount of material used, the process utilized to make the material, and the impacts directly associated with the material. You have to adjust the mass-based numbers to account for the differences in the amounts of each material that would actually be used in the building. In order for these factors to correctly be evaluated, a more comprehensive life-cycle comparison is in order. For example, building teams must consider factors like the time to construct the building, the carbon footprint required to produce a specific quantity of material, the impact of other systems such as increased foundations in concrete buildings, and the thermal qualities of the materials, says Still. Adding to the list, Nasello asks the following questions: How is the material extracted at its source? How it is manufactured, including use of raw materials, recycled content, and pollution, as a result? What is the method of transportation to the construction site? What are the means and methods of construction? What about on-site and off-site waste management, use, and maintenance? And if it is demolished, how is it recycled? Taken together, Davies points out that the longest standing, most durable buildings typically have the potential for the lowest overall carbon footprints because they are correctly evaluated over time. “Those findings get even better when our building materials that are taken out of a deconstructed project are able to be reused for a next-generation design,” he adds. As opposed to a single-attribute comparison, a whole building life-cycle assessment (LCA) produces a more objective, thoroughly evaluated comparison based upon multiple factors. A word of caution, though, as building teams might mistakenly believe that all a LCA comparison requires is a schematic design of a building, a list of the environmental impacts associated with all of the materials that will be used in the building, and a simple drop-in of the numbers into an estimation tool to create a legitimate building comparison. “Pushing a ‘smart’ button and receiving a list of comparative environmental impacts for two building alternatives is not possible. In fact, nothing could be farther from the truth,” states Cross. 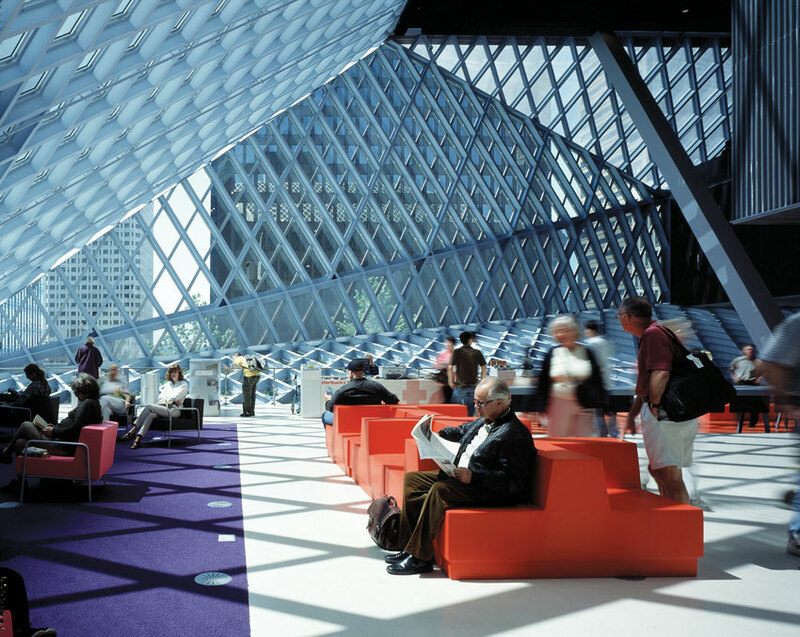 At the Seattle Central Library, the design of a steel diagrid eliminates 90 percent of the aluminum that would typically go into a facade mullion system.